It is particularly useful for quickly setting up environments that need significant customization and set up for continuous delivery. I would say Acquia is less appropriate for smaller scale sites that wouldn't necessarily need the separated environments. Amaxus is well suited as a development platform and content management system for companies who have a dedicated, experienced development team because it has such complex functionality. It is not well suited for companies whose main content updater will be a person with limited development experience, because it is so hard to learn and understand how to use. 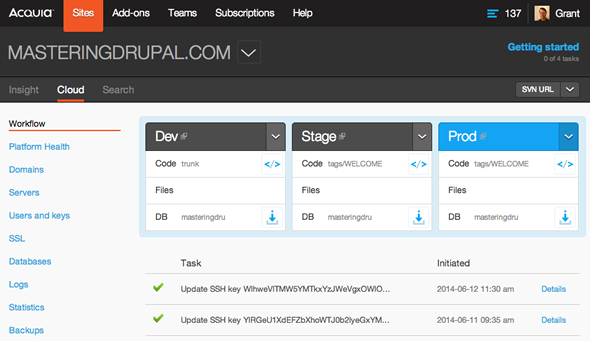 Simplifies installation of Drupal sites with one-click installations. Development, staging, and production environments for a best-practice web development. Access to git repos, databases, and backups that are all managed within the interface. There is a lot of flexibility and power with what you can do. The client has a lot of power to make changes on their own without needing a development team. There is a huge learning curve for developers. All our new website builds were going beyond the timeline because of the learning curve. It is very complex and teaching our clients how to use it required several training sessions. Acquia is more fully featured and mature. I have used an in-house CMS which was very simple and only allowed the user to update very basic templated content, and I have used Sitecore, which is sort of like a middle-of-the-road. Sitecore is great because it allows for the user to have a lot of control over templates and updating content, but it's not so complex that it is very difficult and time-consuming to learn how to use, like Amaxus. It has a negative impact because it put us back on our timelines. It had a negative impact because our customers didn't like the learning curve to use it. It had a negative impact because it caused so much stress among our team to learn it.